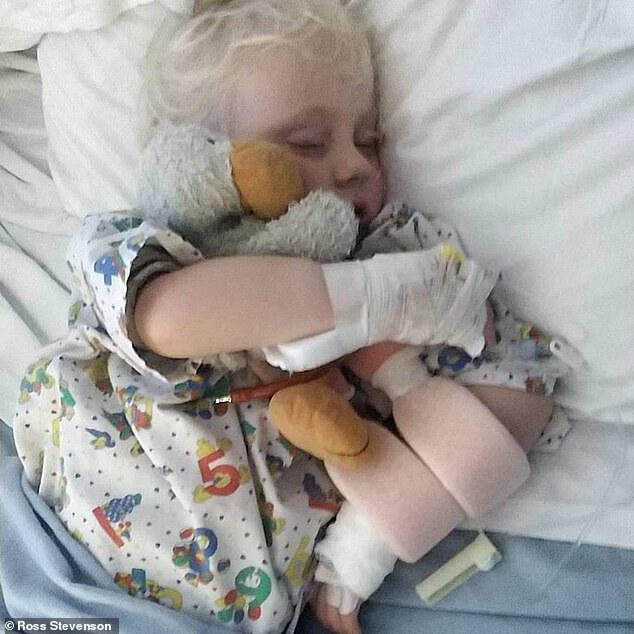 A three-year-old girl has been left paralysed in her left arm after being struck down with a rare polio-like illness. Chloe Stevenson, from Plymouth, has lost the use of her limb and spent months in hospital because of the mysterious illness. She first fell ill in September, with her symptoms taking just a day to progress from a high temperature to paralysis, her parents revealed. 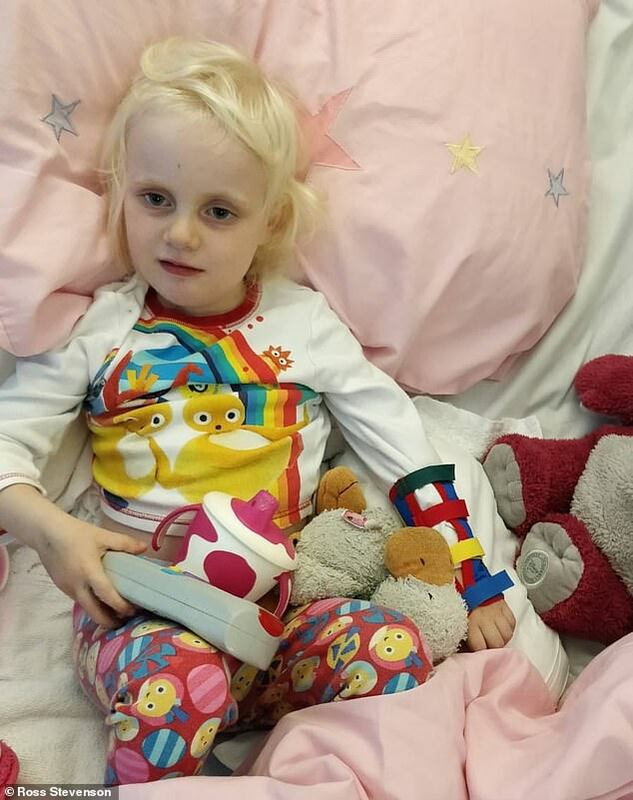 Chloe was rushed to hospital on September 18 and has needed medical care every day since, with most of that time spent in a hospital more than 100 miles from home. In November, doctors confirmed she had acute flaccid myelitis (AFM), a rare and poorly-understood condition more common in the US. Her parents are speaking out after Public Health England launched an investigation last month into a rise in cases of the condition. At least 28 people – mostly children – inexplicably fell ill with AFM last year. 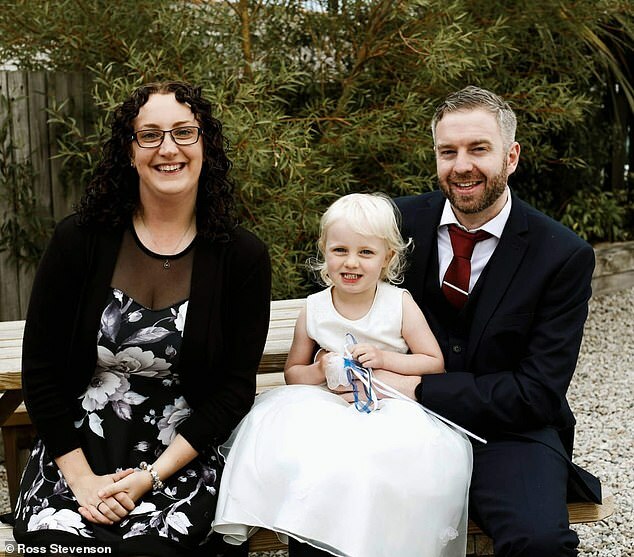 Vanessa Carter, 27, and Ross Stevenson, 31, first noticed something was wrong with their ballet-dancing daughter when she suffered from a fever in her first week of pre-school. 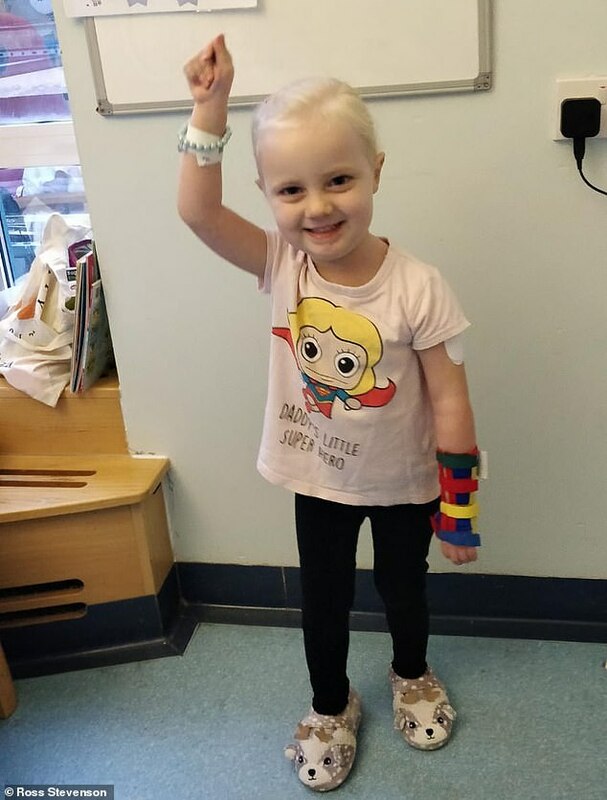 A doctor sent her home with paracetamol and ibuprofen but, when they were bathing Chloe the next day, they noticed her left arm had gone floppy. They rushed her to A&E and she quickly became so tired she slept all day and was extremely weak in one arm, one leg and her core muscles. 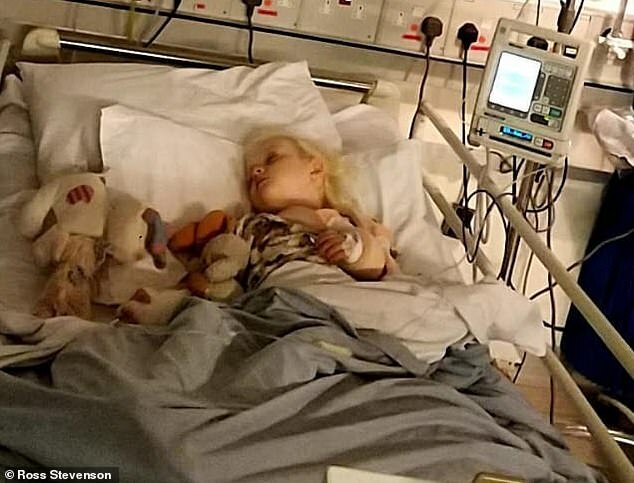 Within five days, the toddler was moved to Bristol Children’s Hospital, around 120 miles from the family’s hometown, where she has spent most of her time since. 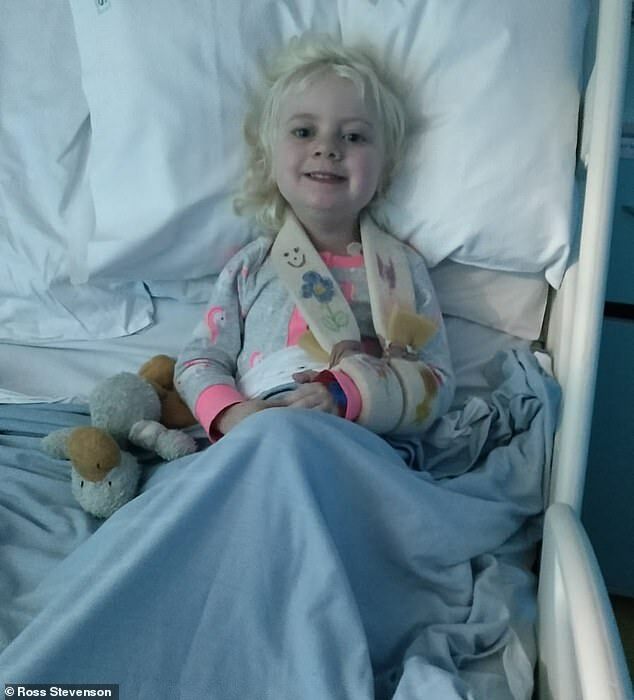 The couple are now trying to raise £10,000 in donations for equipment and extra physiotherapy to help their daughter recover and regain her strength. ‘Her condition was worst at the beginning then got gradually better,’ Ms Carter told MailOnline. 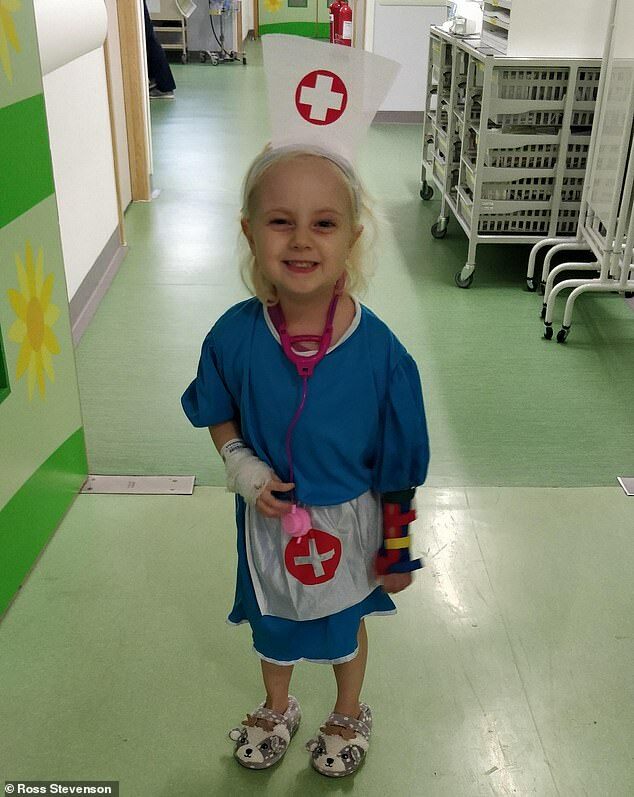 ‘When she was first in hospital she could only wake up for five minutes at a time and became more and more weak. It took around two months before doctors realised what was really wrong with Chloe after wrongly diagnosing her the first time, Ms Carter said. She is on leave from her job in the civil service in order to be with her daughter, while Mr Stevenson – also a civil servant – is working out of an office in Bristol. In December Public Health England said 28 people across the UK developed AFM in 2018 – more than the previous nine years combined. The spike in cases coincides with a record high number of children falling ill in the US, where at least 158 children have developed the illness. AFM – also called acute flaccid paralysis (AFP) – is believed to be triggered by viruses but specific tests are not readily available and medics don’t know how to prevent it. None of the children in the US have died, but the condition has proved fatal in the past. Most cases in England have been diagnosed since September, PHE said, with 60 per cent of them in under-fives and most patients being hospitalised. The Government body has refused to release details of the ages or locations of any patients. Chloe, believed to be the first patient publicly identified, has regained the use of her leg but still has weak core muscles and cannot use her left arm. ‘We don’t know how much she will recover,’ Ms Carter said. ‘She is still in hospital having occupational therapy and physio. ‘I’m struggling to cope with the fact it can do so much damage and it’s scary not to know what the cause is. ‘We don’t know her long-term prognosis and I don’t know if she could get it again. Ms Carter believes it has been difficult to deal with her daughter’s illness because there is so little public information and doctors find AFM so difficult to diagnose. She and Mr Stevenson don’t know any other families going through the same thing, and say they haven’t been contacted by Public Health England. Doctors haven’t been able to explain much of AFM, Ms Carter said, so she has relied on her own online research to find out more. ‘I find most things out by myself,’ she said. ‘No-one knows much about it and that’s the issue. I’ve been reading news articles about children who got it in America. 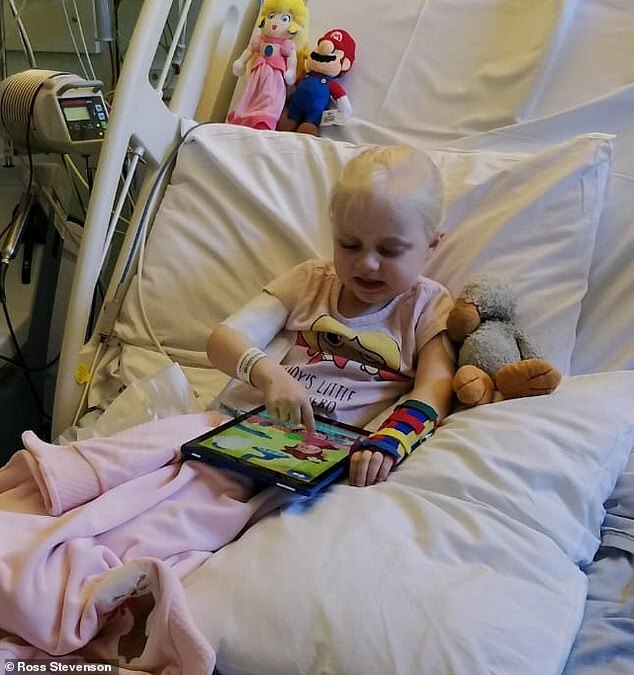 Chloe has been through gruelling treatment in hospital, with MRI scans, general anaesthetic, nerve conduction tests, steroids and plasmapheresis (blood filtering). Her parents hope she will be discharged soon, but are unsure about whether she will be fit to start school in September. AFM most commonly affects children – the average age of patients in the US has been just four years old. Doctors generally have to examine a patient’s nerves, spine and brain, and the fluid around them, in order to diagnose the condition. But because it doesn’t have a single cause and can be triggered by usually harmless viruses, AFP can be difficult to spot fast. The condition is thought to be caused by viruses called polioviruses and non-polio enteroviruses – hence its comparisons to polio, which has been eradicated. Ms Carter and Mr Stevenson are now raising money to pay for equipment to help rehabilitate their daughter. 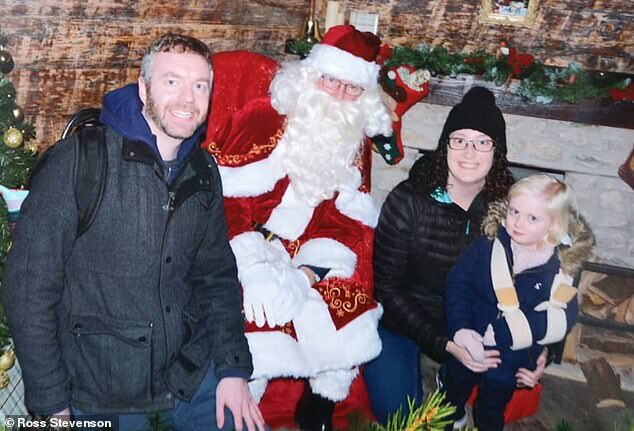 They hope to buy a £4,000 mobile arm aid to help her carry out tasks using her weak arm and a £4,000 electronic stimulation suit to help bring her nerves back to life. They also want to pay for private physiotherapy, costing between £40 and £60 per hour, because the NHS can only offer a limited amount. To donate to their fundraiser, visit the JustGiving page.